At the scene of the massacre, open field, incense burning, etc. Possibly the site of a mass grave. 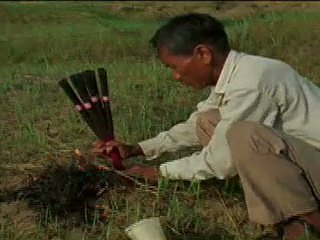 Chicago: “Vietnam: A Television History; Lighting Incense in a Field,” 03/03/1981, WGBH Media Library & Archives, accessed April 24, 2019, http://openvault.wgbh.org/catalog/V_A3C438D548054A4AA6B697B754848C7A. MLA: “Vietnam: A Television History; Lighting Incense in a Field.” 03/03/1981. WGBH Media Library & Archives. Web. April 24, 2019. <http://openvault.wgbh.org/catalog/V_A3C438D548054A4AA6B697B754848C7A>.